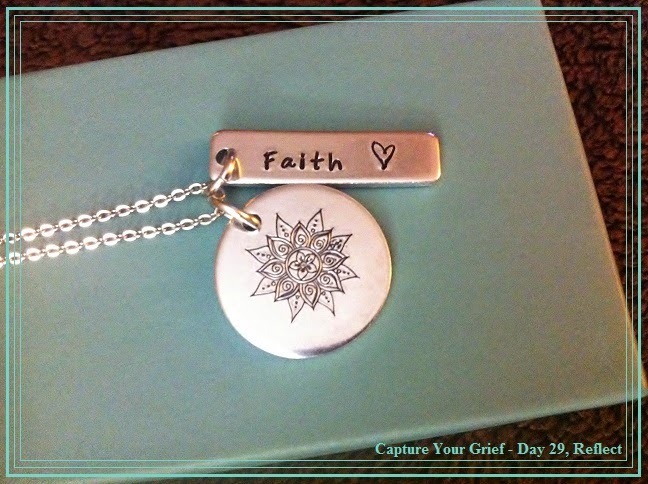 Reflect…that is today’s Capture Your Grief prompt. When I reflect back at the month of October, I am realizing that it has been a very good month as far as my grief journey. I must say that doing this project has been very good for me. Each day I have written a blog post on the prompt provided. Doing so has helped me to view losing Faith in a different way, whether it was focusing on new hobbies that I’ve started or feeling closer to Faith through nature. Tonight, I take a moment to REFLECT on what Faith means to me. She is still my pride and joy. She will be forever. I love her more each day and along with that love, I miss her more every day. I remember a line from Return to Zero when Minnie Driver says that if she quiets herself down she can almost hear her son. I feel the same way about Faith. I can almost feel and hear her when I quiet myself down and get into His peace.